280 p., 14,8 x 20,5 cm. Edited by Johann S. Ach and Andreas Gaidt. With contributions by Johann S. Ach, Dieter Birnbacher, Andreas Gaidt, Anton Leist, Wolfgang Lenzen, Georg Meggle, Ludwig Siep, Richard Toellner, Ulla Wessels and Urban Wiesing. This book offers an introductory overview of the contemporary discussion in biomedical ethics. Special attention is paid to the twofold challenge of this field: on the one hand, biomedical ethics is challenged externally by new sorts of problems issuing from progress in the biological sciences and in medical technology. On the other hand, it is challenged internally insofar as it often produces surprising results which contradict our daily moral intuitions as well as the tradition of moral thought. 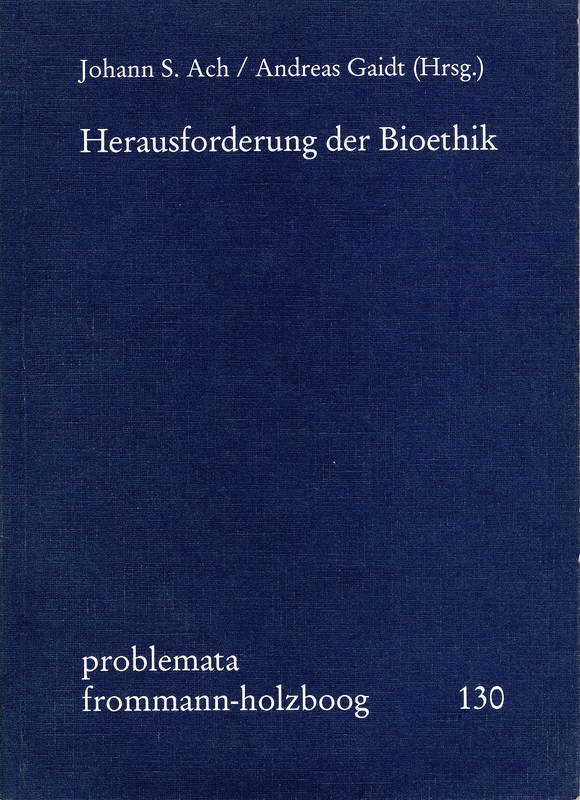 The contributions contained in this book respond to this challenge and, moreover, present a view of the methodological and thematic diversity of the bioethical discussion. Issues concerning metaethics, which reflect precisely this double demand and which also involve questions of methodology, play but a secondary role vis-à-vis concrete bioethical questions of application. Among the issues given special attention are abortion, gene technology and test-tube fertilization. Questions concerning environmental ethics and animal rights are addressed as well. A commentated bibliography is provided at the end of the text in order to facilitate further study into the basic issues of biomedical ethics. Dieter Birnbacher: Welche Ethik ist als Bioethik tauglich? Richard Toellner: Wie relevant ist die Bioethik für die medizinische Praxis? Wolfgang Lenzen: Wem könnte Bioethik nützen oder schaden? Georg Meggle: Ethik – raus aus der Uni?